Angels Toruń beat Bydgoszcz Raiders 40:14 in Kuyavia-Pomerania Voivodeship derby game. Angels are PLFAII north leader. 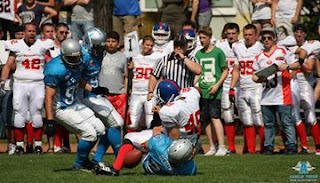 Saturday derby game betwen Angels Toruń and Bydgoszcz Raiders started with quick points made by hosts. First in the endzone was Tomasz Kuska (extra point Bartosz Mróz) 7:0. In first quarter guests sensational score touchdown by Marcin Spłocharski and after two point conversion Raiders lead 7:8. Second part of the game "blue sky and whites" made touchdowns by Łukasz Kuśmirek passes. 30-yard pass to Rafał Kaleta and 11-yard to Przemysław Gołębiewski till half made score 20:8. Third quarter point was open by Łukasz Kuśmirek this time by 7-yard rush. Raiders response by Jakub Widawski 5-yard rush. 20-points lead 34:14 in the end of quarter gave by Radosław Trojanowski receive 25-yard Kuśmirek pass and Mróz extra point (4 time in game and 11 in season- league record). The final score by Paweł Podlas on 40:14. MVP Łukasz Kuśmirek, Angels quarterback who made three passes for touchdown and himself rush in the enzdone. The next Angels meeting held in Slupsk with league outsiders Griffons July 27. Torun football players will once again be seen in action at the stadium Świętopełka street at August 24 meeting with Sabercats Sopot, this game will determine first place in the table second division football.